(Lancaster, Pa., March 20, 2019) - Left-hander Matt Marksberry, a dominant force in the Lancaster bullpen in 2018, has re-signed with the club for the upcoming season after being released by the Arizona Diamondbacks last week, it was announced today by manager Ross Peeples. 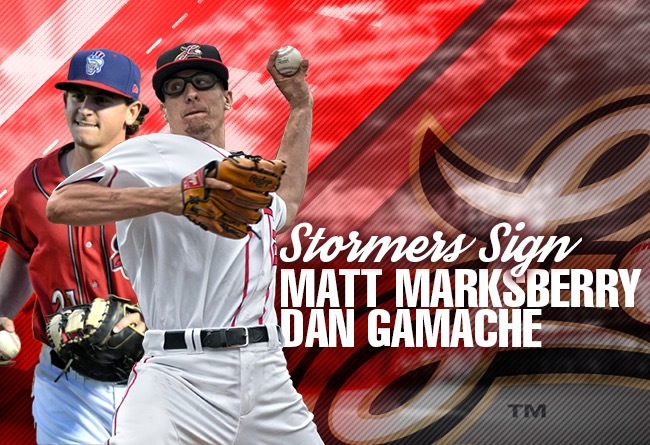 In addition, the Barnstormers have signed infielder Dan Gamache, a Harrisburg Senator in 2018, and have dealt infielder Jimmy Paredes to the Somerset Patriots for a player to be named later. Marksberry, 28, pitched in 45 games for the Barnstormers overall during the 2018 season, going 2-2 with a 1.82 ERA. The Cincinnati native worked 39.1 innings and yielded only 31 hits while walking 27 and striking out 47. Over his final 28 appearances, he walked only eight while striking out 29 and posting a 1.64 ERA. For the year, the former Atlanta Brave stranded 26 of 33 opposing baserunners. Left-handed batters swung at only a .136 clip (9-66). Prior to coming to Lancaster, Marksberry had spent four years in the Atlanta system, including making 35 big league appearances between the 2015 and 2016 seasons. The southpaw signed a minor league contract with Arizona this winter. He appeared in one Major League spring training game, allowing a single and a walk in 2/3 of an inning against the Cleveland Indians. Gamache, 28, signed with Pittsburgh in 2011 and spent six seasons in the Pirates system before moving on to the Minnesota Twins and Washington Nationals. The left-handed hitting infielder played a portion of two seasons (2015-16) with Class AAA Indianapolis while with the Pirates. Last year, he spent the entire season with Harrisburg, where he played for one-time Barnstormer Matt LeCroy. He batted .274 with five homers and 45 RBI in his full campaign with the Senators. He is also a career .274 hitter in 747 minor league games. The native of Rhode Island played collegiately at Auburn University with Lancaster right-handed pitcher Scott Shuman. Paredes, a former Phillies infielder, batted .363 with three homers and 14 RBI in 21 games for the Barnstormers in 2018 before visa complications ended his season. The signings give the Barnstormers 20 players under contract for the upcoming season which begins on Friday, April 26 against the High Point Rockers. Players are scheduled to report on April 14. The Lancaster Barnstormers are headed into their fifteenth season as a member of the Atlantic League of Professional Baseball. Home games are played at Clipper Magazine Stadium in downtown Lancaster, Pennsylvania. Please call 717.509.HITS (4487) or visit www.lancasterbarnstormers.com for more information.